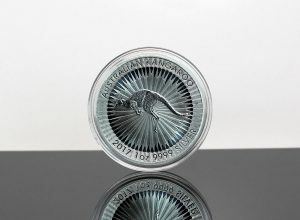 Sales of Australian bullion coins and bars slowed in April, according to the latest figures from The Perth Mint of Australia. The Mint’s gold sales dropped for a third straight month and to their weakest point in at least four years and their silver orders retreated to a four-month low. These sales registered against a backdrop of mixed precious metals in April with LBMA prices 1.7% higher for gold and 3.6% lower for silver. April sales of Perth Mint gold coins and gold bars climbed by 10,490 ounces, the lowest monthly total since CoinNews started tracking the Mint’s data in February 2013. The level marks declines of 52.8% from March and 77.9% from April 2016. Year-to-date gold sales at 130,724 ounces fell 27.5% from the 180,312 ounces delivered in the first four months of last year. The Perth Mint sold 468,977 ounces in silver bullion last month, logging declines of 34.5% from the previous month and 59.6% from a year earlier. For the year to date, silver sales at 2,918,480 ounces dropped 49.4% from last year’s starting four-month total of 5,440,474 ounces. Below is a monthly summary of Perth Mint bullion sales from April 2016 to April 2017. The figures show monthly ounces of gold and silver shipped by the Minted Products division of The Perth Mint to wholesale and retail customers worldwide. It excludes sales of cast bars and other Group activities including sales of allocated/unallocated precious metal for storage by the Depository.